My reputation tarnished by their thin veneer. Sneering through the false smiles of a thin veneer. Tying to hide the cracks with a thin veneer. Masking my depression through a thin veneer. Each wall that stands before me is a thin veneer. Canute Rebuking the Flattery of His Courtiers [watercolour] John Martin, 1842. Laing Art Gallery. 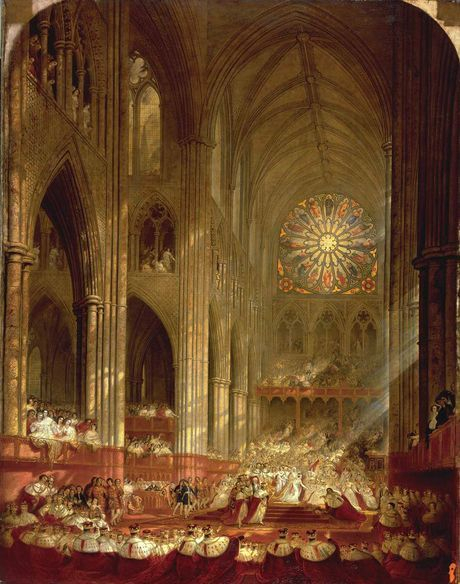 The Coronation of Queen Victoria [oil painting], John Martin, 1829. Tate Britain. Throughout the second half of the 1830s the sources of John’s prosperity were drying up, whilst his commitments had greatly increased. He had a wife and five children and his nephew Richard, who were all entirely dependent on him and living with him in a large house. As a result, maintenance and education costs were an enormous drain on his finances. Furthermore, his three brothers, William, Jonathan, and Richard were habitually sponging on him, plus his lavish hospitality in hosting weekly entertainments for the rich and famous of London was constantly eating up his resources. Meanwhile, his schemes for improving London had resulted in failure. After a decade of misfortune and a long period of deep depression, however, he showed his mettle and eventually managed to turn his fortunes around and achieved a second period of success, beginning with his painting ‘The Coronation of Queen Victoria’ in 1839. This led to further commissions and the regular exhibiting of his latest works.